Looking to Effectively Market Your Business? The Santa Cruz Area Chamber of Commerce offers a wealth of marketing opportunities for Chamber members. As the trusted source for business, the Chamber's marketing options augment and expand your own business's marketing reach and visibility in an authentic way. 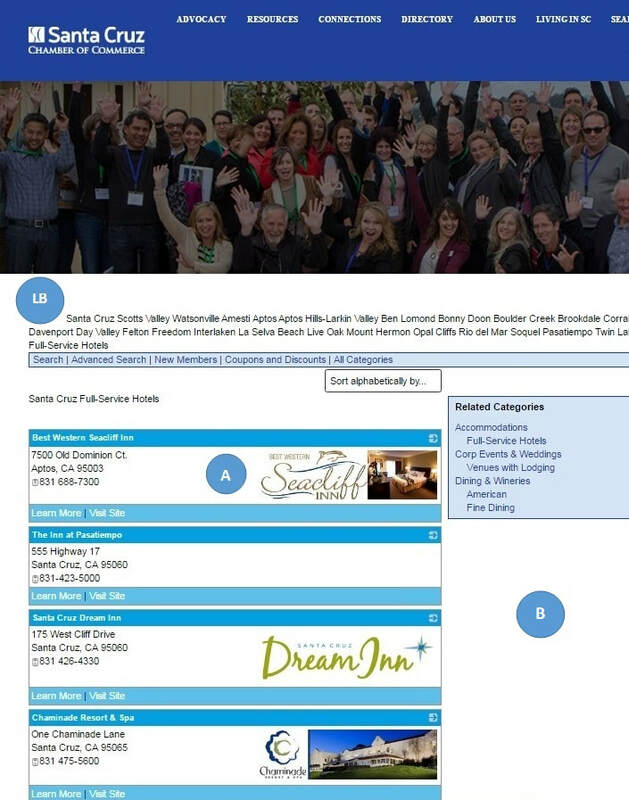 By leveraging the marketing opportunities available with your membership, both online and attached to Chamber events, your business expands its brand widely in Santa Cruz county and beyond. The Chamber’s website is one of the Chamber’s best referral tools, available 24 hours a day, 365 days a year. The website receives more than 145,000 visitors every year. Advertising pricing is competitive and includes tools to help you track your web traffic, including impressions and clicks. The Chamber website is also a winner of several web design awards. The site received an Outstanding Achievement Interactive Media Award, an Award of Distinction Communicator Award, a Silver Davey Award, and a Bronze Horizon Interactive Award. The Chamber's weekly newsletter is e-mailed to more than 5,200 people who have signed up to receive news from the Chamber and its members. Advertising rates are extremely competitive and your message reaches a targeted local audience. 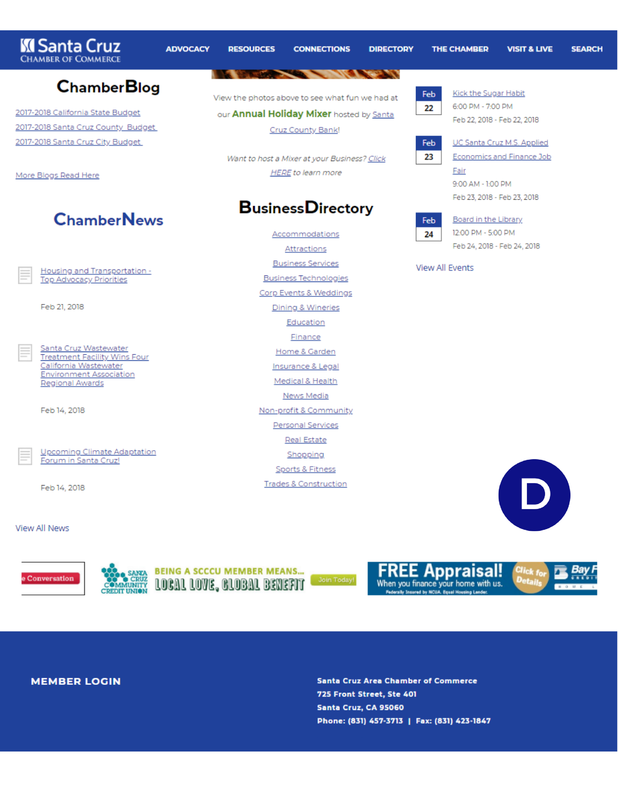 ​​As part of your Santa Cruz Area Chamber membership, you can share your business news on the Chamber’s website and out to the community in the Chamber eNews. Posting a news story on the Chamber website is a great way to let the community know about your business or organization, improve your online presence, plus get traffic from the Chamber website to your website. And it's included in your membership package! Do you have a news-worthy topic that you'd like to share with our community? Is your company celebrating a milestone, announcing a new product, adding or promoting staff? Why not tell us and we'll put it online! Just fill out the Press Release submission form to notify the Chamber about your news. For more information on writing your Press Release, see our Press Release FAQs. To see examples of Press Releases, see Member News. ​ Community Calendar. The Chamber website consistently generates significant numbers of visitors. Grab some of this attention for your own business! To add your event to the Community Calendar, please login to the Members-Only section of the Chamber website, choose "Submit Event" from the list, and fill in the blanks. (If you don’t know your username and password, please call the Chamber at 831-457-3713.) For more information on submitting your event to the Chamber Community Calendar, please see Adding an Event to the Chamber Community Calendar. If you would like to do your own direct mailing, you can buy a list of Chamber members for one-time use. This is a spreadsheet with all member organization names, addresses, phone numbers, main contacts, and number of employees. Besides creating mailing labels, the spreadsheet enables you to make personalized letters and create targeted mailings. Please Note: We do not sell email addresses, as we do not have permission from our members to share their email addresses. Ribbon Cutting Ceremonies are fun, effective, and popular promotional opportunities for Chamber members. Does your business have a grand opening, re-opening, remodel, anniversary, new product offering or other significant milestone you’d like to celebrate with the community? The Chamber provides the ribbon, scissors, access to elected officials, robust promotion of the Ribbon Cutting, and advice for your planning. Schedule and plan your Ribbon Cutting Ceremony with the Santa Cruz Area Chamber office. For more information, please see Ribbon Cutting. Please Note: For Members in our Advantage Tier level and above, The Chamber will host and plan your Ribbon Cutting for FREE! Ribbon Cuttings are also available for other member packages at $250 per Ribbon Cutting ceremony.y. To request a Ribbon Cutting Ceremony, please complete the Ribbon Cutting Request Form or call the Chamber office at 831-457-3713. Santa Cruz Area Chamber "Business After Hours" are excellent opportunities to showcase your business, meet prospective clients, and build relationships with business people from small, mid-size and large Santa Cruz county businesses and organizations. And, Business After Hours are fun! You must be a member to host a Business After Hours, but you may co-host with another business, caterer, or winery that is not a member of the Chamber (with approval from the Chamber). The Chamber only holds 12 Business After Hours each year - the opportunity to host a Chamber Business After Hours is in high demand, so please contact us early to schedule and start the process. For more information and to request your Business After Hours, please see Business After Hours. Please Note: Advantage-level, Executive-level and above memberships include the benefit of hosting a monthly Business After Hours. The ability to host a Business after Hours is also available for other member packages at $250 per Business After Hours. The Chamber’s Sponsorship packages include robust marketing resources and event participation and offer significant visibility and highly positive recognition for your business. Attendees at the event you sponsor have an opportunity to learn more about your business as a result of your sponsorship. Each sponsorship includes a variety of marketing, advertising, and promotional items that showcase your company. Your sponsorship investment brings visibility to your brand without requiring a large investment of your time. As a Chamber sponsor, your business takes on the role of community investor and “good corporate citizen”, it enhances your organization’s positive image and provides significant publicity. Your sponsorship provides the opportunity to enrich relationships, to stand out from competitors, to showcase your products and services, or to drive new business opportunities. And just as important, your sponsorship provides direct supported of your Chamber towards our shared mission of enhancing economic prosperity. Business Expo, the Recognition Awards Gala, the Leadership Forum series, and the Community Leadership Visits. Please call the Chamber office for more details: (831) 457-3713. Display your Chamber member decal at your location and on any company vehicles, and include the Chamber logo on your website and in advertisements and marketing materials. Please let us know if you need other sizes of the logo or if you would like additional decals. Downloadable Logos: Right-click on an image below to download or click the "Download File" below for Santa Cruz Area Chamber Member Logo for 2018.